We are starting back 5th April 2019 at the track 6-7pm - but no cycle club on the 19th as it is Good Friday. Jenny has been improving her balance with scoot and glide for weeks, first with no pedals, then with one then with two. Today she did the pedalling bit as well! Fantastic! Click here for a video. A ride on the Monsal Trai! To round our year off we chose the Monsal Trail for a club ride away from the track. We rode from Hassop to the Monsal Head viaduct and then back for a packed lunch. Many thanks to Duncan for acting as our Ride Leader for this our very first outing. See the gallery for photos. After lots of practice on the balance bikes over the summer Joe cracked it this week and rode a bike for the first time! Wow! Well done Joe and a second sucess this year for our cycle club. Massive celebrations all round - Well done Joe! After mastering a balance bike over the last few weeks Jordan rode a bike for the first time - see the gallery! British Cycling coach Rob Mace will visit for another session aimed at our 2-wheeled riders to develop their cycling skills on Friday 20th July. 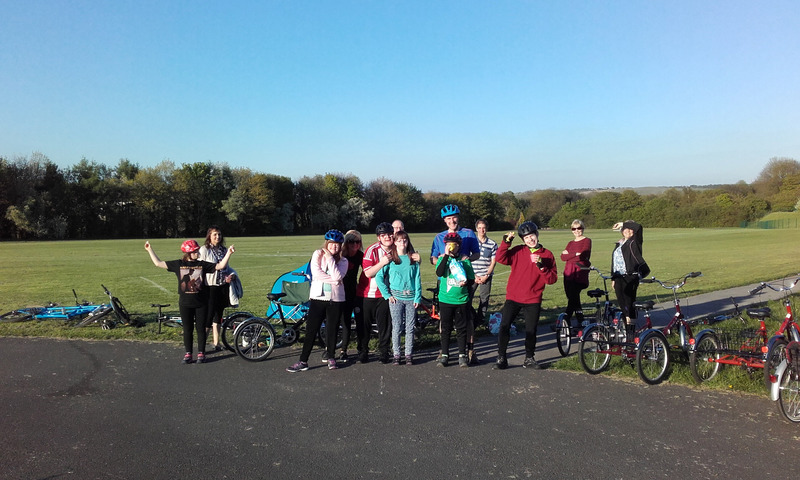 Our club is growing and we have a limited number of specialist trikes/bikes so if you do recommend our club to others please ask them to contact us first, the last thing we want is disappointed young cyclists. There is a Sheffield Cycling Festival 'Let's Ride' on Sunday 15th July 11am in and around Endcliffe Park. Check it out at Lets Ride Sheffield . A big "thank you" to Rob Mace from British Cycling who came down to the track and gave a free training session called 'Ready Set Ride' . He talked with parents, giving some pointers about learning to ride, and then demonstrated a a couple of fun exercises with our would-be cyclists. See the gallery for some photos! . The Ride for Eric on 20th May was unsurprisingly full of cyclists. There was a 5km ride around the track and and a 25km ride that took to the streets before returning for a final lap of victory. There were a number of stalls including Yorkshire Rose Cycle Club , Recycle Bikes, massage for aching muscles after the rides and a stationary bike connected to a liquidiser for making milkshakes and smoothies. We were made to feel welcome, did a few laps with the trikes and tag-along, and swapped leaflets with people. One little girl made good progress using one of our balance bikes. Nice convivial atmosphere and we did a lot of chatting. Top man this week has to be Jordan, who tried one of our balance bikes and after a few minutes was scooting and gliding like a pro. This week we also became affiliated to British Cycling . This gives us access to help and advice for our club and includes public liability insurance. This week we took delivery of new equipment including 3 beautiful trikes, 2 bikes, 2 balance bikes, helmets and other gear all courtesy of funding from Sheffield City Council and Within Reach . We tried them out at our Friday session. Many thanks to Evans Cycles for helpful advice, putting the order together and delivering the kit.